"Entertainment Tonight and The Insider Present Live Video from the red carpet of the premiere of 'The Twilight Saga: Breaking Dawn Part 1'. See your favorite stars walk the carpet and watch the premiere, as it happens! 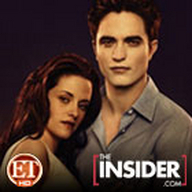 Click below to see more 'Twilight' related videos and go to ETonline.com and TheInsider.com for more Twilight news and photos!"